Traveling via Airstream is great, but I also love being able to park at an event and spend the night. At the end of a day at the fair, jam, balloon fest or rally it’s really nice to just retire to your home rather than getting in the car to drive away. When you’re camped at the event, you’re usually away from the general parking crowd and close to the action, too. That’s why we took the Airstream to the Copperstate Fly-In rather than just making a long daytrip out of it (80 miles from our home in Tucson). The Copperstate Fly-In is not so large that access is a problem even for casual visitors, but still it was nice to be camped just a few feet from the flight line. The RV camping area is just a dusty parking lot with white chalk lines to delineate sites — nothing fancy at all. No hookups, just blue porta-potties and trash cans. For $10 a night it was a decent value because of the proximity. 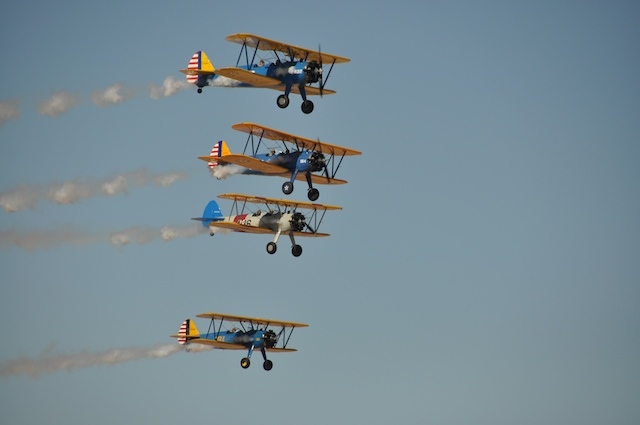 We could see the aircraft taking off without even leaving our site, and easily hear when some warbirds were starting up for some formation flying. The only downside for us was the generators. Quiet hours were posted for nighttime, but during the day several RV’ers left their generators running up to six hours. We were unlucky enough to be parked near several of them, and the fumes were constant. I’ve seen many cases where people did this in hot weather because they (or their pets) needed air conditioning. Dealing with heavy generator use seems to be a regular factor when we attend these sorts of events. Being October in the Sonoran desert, we could have gotten any kind of weather. We were lucky enough to get near-perfect weather for a fly-in: highs in the low 80s, clear skies, and not much wind to kick up dust. Visibility was typical for this area, about 20-30 miles. Like most fly-ins, access to the airplanes and the owners was excellent, so we could walk up and talk to anyone about anything we saw on the field. 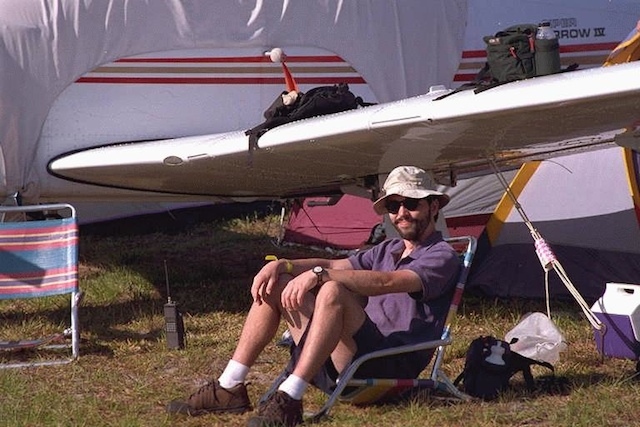 I spent a lot of time with the Cirrus guys and sat in the SR-22 G3 Turbo X (fantasizing), and also chatted with owners of powered paragliders, warbirds, biplanes, helicopters, and light sport aircraft. There were also amphibious aircraft, homebuilts, and a gyrocopter. 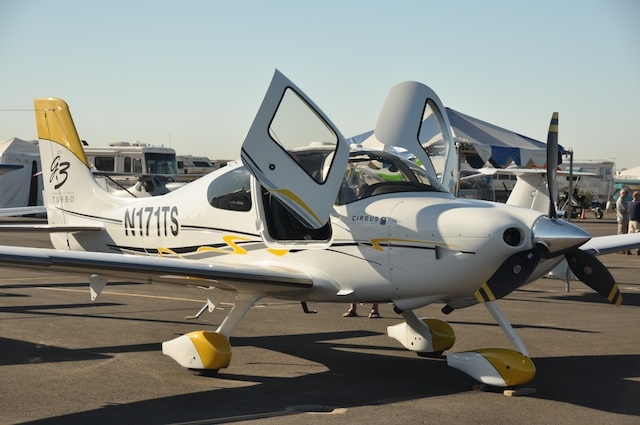 By the way, Emma was very comfortable in the Cirrus’ back seat, and it looks pretty easy to fly. Does anyone want to make a donation? I just need another $600,000 to buy it. If you want to see more pictures from Copperstate, check out my Flickr album. 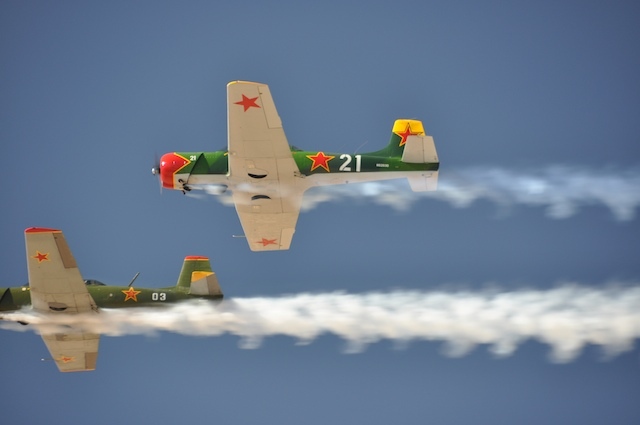 I uploaded 156 photos there, enough to satisfy all the airplane buffs in my audience, I hope. We spent three nights camped at Casa Grande Municipal Airport, so there was plenty of time for side trips to the area around Phoenix. One stop we made was to the Queen Creek Olive Mill, to take the $5 tour. It’s a relatively brief one, involving an informative talk about olives, olive oil, and the pressing process, and then a quick look at the room where the extra-virgin oil is pressed out. The pressing machine itself is the least interesting thing. 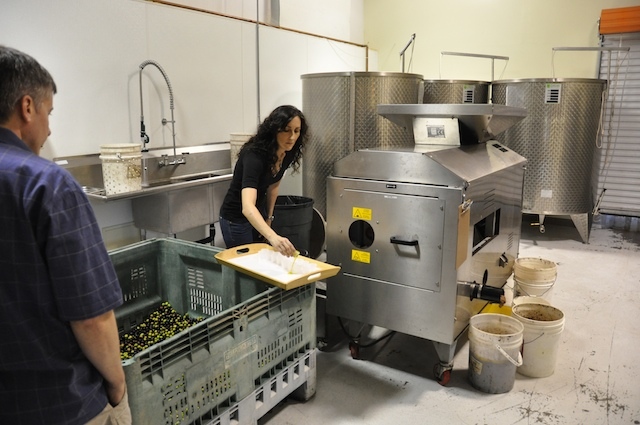 It’s basically a large box from which oil and “pomace” (leftover olive bits after pressing) come out. But the guide and informative signs all around are educational, and the gift shop/restaurant are well done. I recommend the gelato. This trip is one of the very few times we’ve done an “out and back” short trip from our winter home base. The nature of these trips changes a lot of our assumptions about how we travel and what we do. Most people do only these sorts of trips, but for us it is the exception, and we are still getting used to it. Some aspects are really great, like the low fuel consumption. In four days we used only 1/2 a tank of fuel including 140 miles of towing and about 150 additional miles not towing. 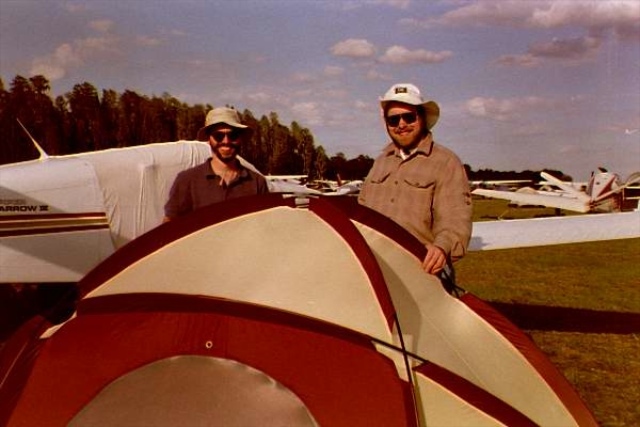 Other aspects are not so great, like the day we spent re-packing the Airstream. If there were more multi-day events available in the area with RV parking, I think we’d do more … something for event organizers to consider. I certainly intend to take my own advice. Here’s a sneak preview. Next year, Airstream Life magazine will be hosting a major event. It should be great fun, with seminars, vendors, entertainment, a barbecue, and much more. It will be open to all RV owners (Airstream and non-Airstream, new and vintage), but be warned, if you show up in an non-Airstream trailer we will convert you on the spot! As to location, all I can say is that it will be east of the Mississippi. I can’t reveal more at this time but there will be a formal announcement with all the details sometime in November. The corollary to this is that the popular Vintage Trailer Jam will not be back in 2010. The co-sponsors of the event have decided not to continue with it. We all had fun but we’ve decided to let it go. So if you’ve got time next summer, keep an eye open for the new event. And now, we return to our regularly scheduled program of home life in Tucson, AZ. We are back at winter home base, 12,000 miles and four months after departing Tucson at the beginning of summer. The Airstream is tucked into its bay and connected to water, sewer, and electric. We’ll be clearing out half of the stuff in it, partly to clear space for future guests who will stay there, partly because we need those things in the house (like my office equipment, Emma’s books, and Eleanor’s sewing machine). A summer full of gifts, treasures, and miscellany needs to come out, be sorted, and dealt with, and we’ll do that over the next couple of weeks. As we planned, the house was ready for us when we returned. Everything we needed was still in place, so our first night back was a matter of moving some food and the computers. I needed only to turn on the air conditioning (it was well into the 90s when we arrived), light the water heater, and plug in the Internet modem — ta-da! — instant home. Clean sheets on the beds, fridge already cooled down thanks to our wonderful neighbor, and …. uh … what are these tiny black pellets in the kitchen drawer? And hey, look, they’re in here too. In fact, they were all over the house, concentrated in the kitchen and bathrooms. Rodent droppings. Looks like we had a visitor or two while we were gone. That meant a serious program of cleaning for two days. Hantavirus is a possibility in Arizona, and we don’t want it. Good thing we left very little food in the house (and it was all sealed tightly). The critters ate part of some scented soap in Emma’s bathroom, chewed holes in a bag of soup mix, and not much else. I doubt they were here for long, since there was no water available. But finding unwanted guests was the worst thing about coming back. We were greeted enthusiastically by all of our great neighbors within minutes of showing up, and that made a huge difference. You can pull in after a long trip feeling tired, hungry, grumpy, and stressed about all the unpacking work that has to be done, but with a few people who are happy to see you waiting by, it all feels much better. Carol swept the dust off our front doorstep, Mike had some of our recent mail, Tom received a book for us that came last week via UPS, and Kevin was keeping an eye on everything with his trusty peacekeeper in reserve. Frank and Joanie swung by within an hour to say “welcome.” You can’t beat neighbors like we’ve got. Oh, sure, there are a few weeds in the backyard, but I’ll deal with those once the heat ends. No rush. Right now we need to give ourselves time to make the adjustment again, from 200 highly mobile square feet to 2,000 completely stationary square feet. It’s harder than you might think. Everything changes, from daily habits to traffic patterns. What you do each day changes. The places you go, the things you think about, what you buy at the store, the clothes you wear …It’s a shock to the human system, like switching from a life as a suit-bound Wall Street executive to a Red Cross workers in Ethiopia. We’re all adjustable but still, big life changes take time to absorb. Speaking of rodents, we have a few others in the back yard. Pocket gophers have apparently been a long-time feature of this particular property, at least according to one neighbor. Over the past two years, as I have carried on my campaign to eradicate the invasive grass, they have flourished under my neglect. Now the backyard is riddled with mounds and holes. They even pop their little furry brown heads up during the daytime and toss dirt into the air. I have a destination in mind for those gophers and it’s not Disneyland. I had thought that there was no need to remove them until we got more serious about making our backyard something other than the wasteland it is at present, but now I’m re-considering. In the meantime, they are providing a useful service. They have burrowed under our composting bin (it has no bottom) and tunneled through our rotting vegetables. This introduces air and soil into the compost mix, which speeds decay. I looked in the bin and found that everything we left in there last winter had decomposed, except for a few late items that simply dessicated before they could break down. It’s “gopher-assisted composting,” a new concept that may be more palatable than vermiculture. I’ll re-start the pile with some water and fresh greens. Useful or not, a supply of traps seems to be in order. Anyone who potentially carries hantavirus is not welcome to inhabit our house or our silver guest house in the carport. We would prefer that visitors coming to Tucson this winter be capable of walking on two legs and using the bathroom rather than our kitchen drawers for their ablutions. It’s not a lot to ask, is it? We’ve been chased by weather for the past few weeks. It seems that lately every time we leave a place, it gets inundated with horrible weather. We fled the upper peninsula of Michigan, Wisconsin, Minnesota, Wyoming, and Colorado, each time two steps ahead of cold rain, storms, and even snow. The weather we have experienced has been very fine almost consistently, despite the fact that we have been running on the ragged edge of winter in these northern states and higher western elevations. We’ve been lucky. As I mentioned, traveling in the shoulder season also means fewer campsite choices, but there are still options. We wanted to visit Walnut Canyon National Monument after leaving Petrified Forest. There’s no campground at Walnut Canyon, and the Coconino National Forest campgrounds closed over the weekend, but there is a Cracker Barrel restaurant and a Wal-Mart just a few miles away in Flagstaff. That’s what I meant yesterday when I talked about flexibility. There’s always a way, even if it is perhaps not the most glamorous. So from Petrified Forest we drove directly to Walnut Canyon, hiked the 0.9 mile Island Trail (with 240 stairs up and down), and then continued on to Flagstaff for the night. 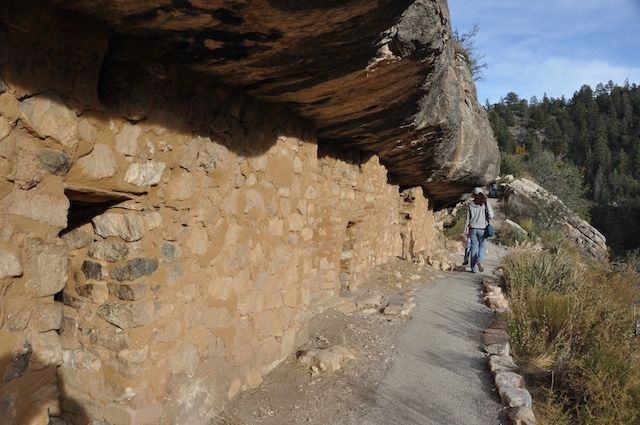 Walnut Canyon is a remarkable ancient cliff-dwelling site, with literally hundreds of ruins in a relatively small area. The Island Trail brings you past 24 cliff homes, many of which you can enter. The trail is a little strenuous if you aren’t in shape because of the 185 foot stair climb at nearly 7,000 ft elevation, but most people seem to handle it just fine. We’ve seen a lot of cliff dwellings over the past couple of years, but they still inspire a tingly sensation of ancient mystery for me. For hundreds of years, people lived here in these lofty rock homes. They struggled hard to build houses of stone where mountain goats would struggle to walk. They farmed squash and corn in a climate so dry and soil so sparse that large trees cannot live. Generations of people, raising families communally, experienced all the drama of our modern lives, rich with stories … and hardly any record of their experience survives. I can only look at the stone alcoves and wonder. We could have lingered in Flagstaff, or detoured north to the south rim of the Grand Canyon, but we’d already made the decision to head home. From Walnut Canyon it is an easy drive to I-17 and then down, down, down from Flagstaff off the rim of the Colorado Plateau. Farewell, high elevations and chilly weather. In less than two hours we bottomed out at 3,400 feet and then climbed back up to 5,000 in the town of Prescott, AZ. We are still at moderately high elevation but we’ll continue downward soon enough. We are making one last stop before we return to home base. Prescott is where our friend Rich C now lives. We traveled with Rich for months back in 2006 while he was full-timing and searching for a new home. He found a new life in this funky western town, and has built a small business downtown making art prints and selling his photography. We haven’t seen him in over a year, so it was time to drop in and check on things. As a bonus, our gruff and itinerant friend Gunny also happens to be visiting Prescott, so it’s a reunion of sorts. The final trip segment is now determined. We’ll spend two nights here in Prescott, then drive 222 miles to Tucson (with a brief stop in Tempe for an extra bag of frozen Swedish meatballs from IKEA). Our summer travels began on June 17 and will end on October 16 — almost exactly four months on the road. The total mileage will come to about 12,000 (including side trips and unhitched travel), of which about 85% is towing miles. If you are looking for grand conclusions, you might be disappointed. Although our travels will cease again for a little while (perhaps six weeks, perhaps longer), I don’t see this as an end at all. We are simply switching gears for a little while. I can’t conclude my thoughts because I don’t see a conclusion yet. We are still traversing the Maze of life, still trying to grow bigger in relation to our surroundings, still trying to understand the world. At most, we will pause to reflect, but the long walk through The Maze will continue. I’ll keep writing, too. There is always a way. Keep that in mind when you travel. When you have little time off (say, a long weekend), and many things you want to do it’s easy to get worked up when things don’t go exactly to plan. In the Tour of America blog I always emphasized the importance of flexibility, because only by being flexible could we deal with the many unexpected events that travel threw at us. In other words, we had a choice: we could go through life on the road constantly being disappointed by things … things we couldn’t do, things that went wrong, things that made life a little harder … or we could roll with the punches, think creatively, and look for alternatives. “Always look on the bright side of life.” This has been particularly applicable to our overnight stays lately. To get to the places we wanted to be, we’ve had to work a little outside the box. On Monday we drove from Cortez CO down through the Navajo Nation on Rt 491 about 100 miles to Interstate 40. As drives go, Rt 491 is not especially fantastic but it is not bad. The Navajo Nation is sparsely settled, with a few small towns that hold most of the population. Along the road you’ll see scattered homes and small farms, and almost every home has a traditional hogan beside it. 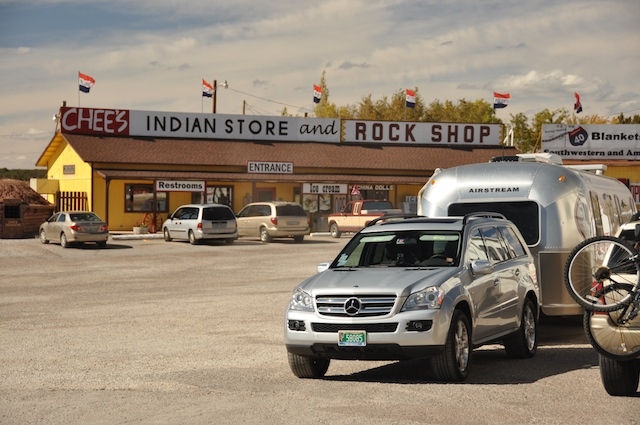 If you look closely you might see small hand-lettered signs for “Indian Frybread” or other items for sale, but it’s not until you reach I-40 that the big-time tourist traps start to appear. There are several along I-40, including Geronimo’s, Chee’s, and Indian City. You can get authentic Navajo rugs and other crafts in these places, but beware … if you see a rug (not a wall hanging) that costs less than $200, it’s probably not a true Navajo rug. They are meticulously hand made and quite expensive, even in the small sizes. $600 for a 3×2 rug is not uncommon, if the quality is high. Our goal for the day was Petrified Forest National Park. For drive-by park visitors, this has to be one of the most convenient in the USA. You just exit I-40 and there you are at the Visitor Center. The entire park is a drive-through, with pull-outs or parking lots at all the interesting spots. 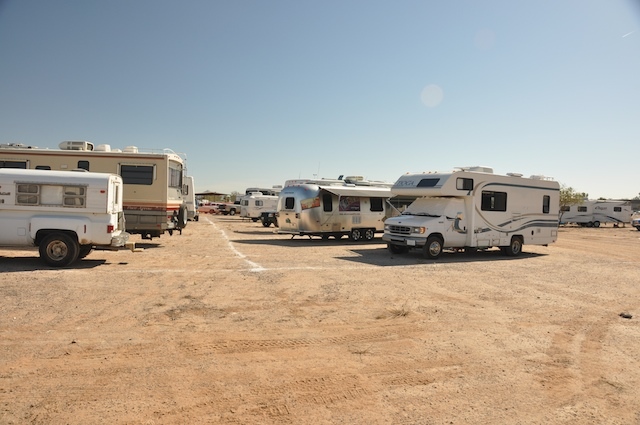 Almost all of the parking lots are big enough for any RV. If you have a full day, you can putter down the 28-mile road, stop at half a dozen good places, and exit the park at the southern end with time to spare. That puts you on Rt 180 which brings you northwest to I-40 again. 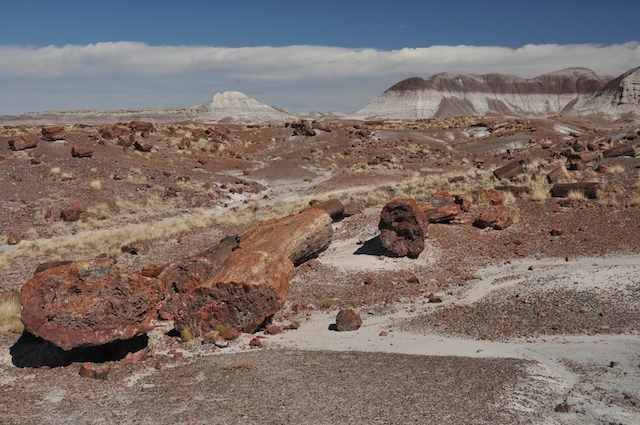 There is a little hiking to be done in Petrified Forest. We’ve done most of the hikes before, but somehow managed to miss the “Long Logs” and “Agate House” trails from the museum/visitor center at the south end of the park, so we did those this time. Both are well worth the short walk (about 3 miles in total on level ground), but don’t be surprised if there’s a strong breeze. There’s not much to block the wind here, and it seems to be windy more often than not. 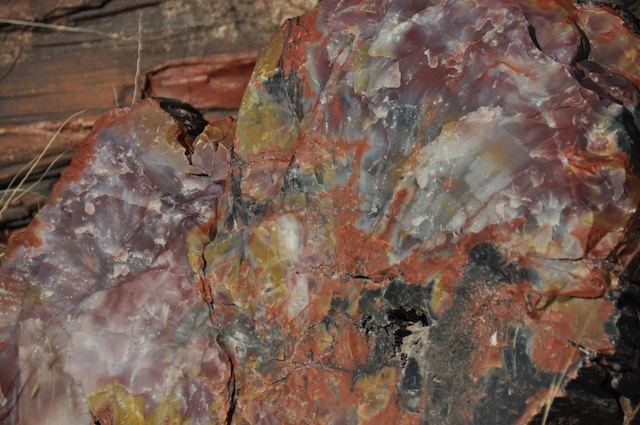 When you see all of the incredible and colorful petrified logs, the temptation to pick up a tiny piece as a souvenir is strong — but don’t do it! The park is amazing because people have been restrained enough not to loot the logs, and so they are still lying there at your feet as if you were the first person to discover them. There’s more to the park than just petrified wood, too. 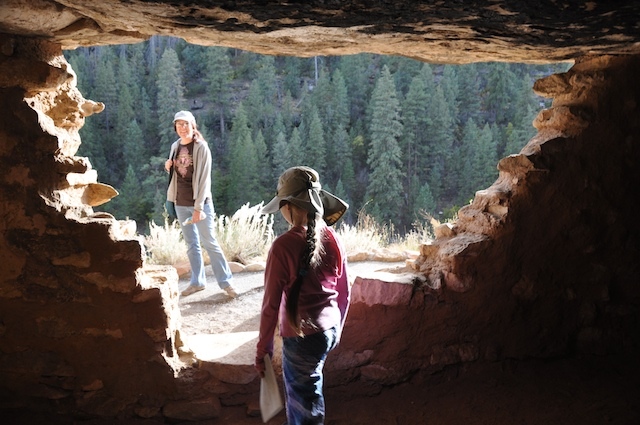 You’ll find some fantastic concentrations of petroglyphs at Newspaper Rock, and the remains of a small Ancient Puebloan settlement, called Puerco Pueblo. 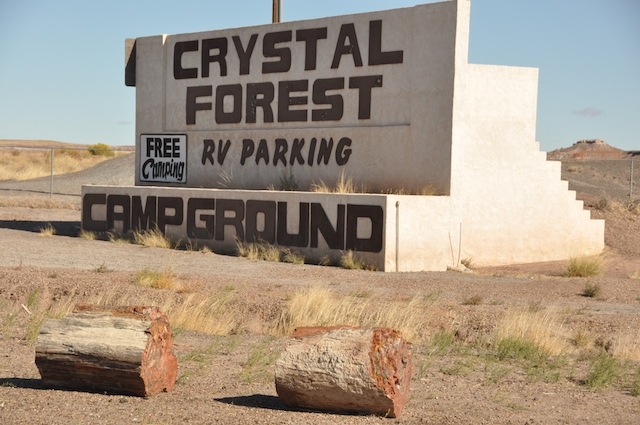 For RV’ers, the minor challenge of Petrified Forest National Park is that there is no campground anywhere in the area. You have two choices: just drive through and continue to your destination elsewhere, or spend the night at one of the two large gift shops at the southern entrance of the park. Overnight parking there is free there, but if you want them to turn the electricity on you need to buy something in the store. Since there is no traffic in or out of the park at night, it’s beautifully quiet for sleeping. That’s where we ended up for the night on Monday. On Tuesday we towed the Airstream back into the park for a second shot at some of the places, then had lunch in the Airstream, and finally departed to the west. I’ll describe our next stop, and the dodge we had to invent to make a national park visit possible, in tomorrow’s blog.